The husband of Asia Bibi, the Christian woman recently freed from death row in Pakistan, is pleading for President Donald Trump and other Western leaders to grant his family asylum, as fears for her life persist. In a brief video message seen by Reuters, Ashiq Masih also begged Canada and the U.K. to consider opening their doors to the persecuted mother of five, who is now believed to be living in terror at an undisclosed location in Pakistan. 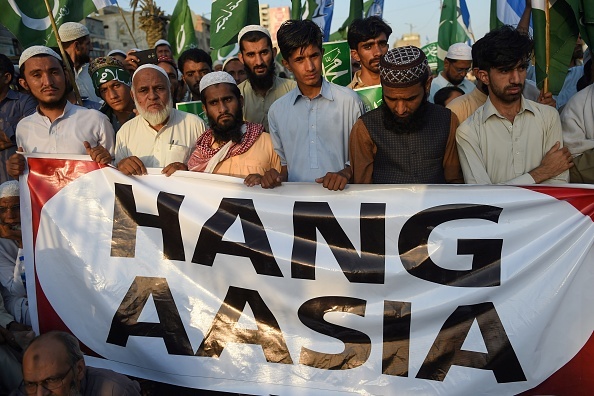 Asia Bibi was acquitted last week by the Supreme Court of Pakistan of allegedly insulting Mohammed in 2009, which is a capital offense in Pakistan. She was accused of the crime by Muslim women from her small rural village outside of Lahore, Pakistan, who allegedly claimed she mocked Islam and its prophet during a quarrel over a cup of water. Within days, Bibi was set upon by a mob of enraged Muslims, who beat her viciously and brought her before the village cleric, who demanded she convert to Islam or be killed. Bibi, a Roman Catholic whose family was the only Christian one in her village, refused, but begged for mercy. Pakistani police escorted her to prison, and she was eventually charged with the crime. She remained on death row in a windowless, 8-by-10-foot cell in Lahore for nearly a decade. Since her acquittal, violent protests have erupted across Pakistan, bringing parts of the country “to a standstill,” according to the New York Times. Fearing for his familys safety, Bibis lawyer Saiful Malook has fled to Europe. In an attempt to placate the violent Islamist mobs, Pakistans prime minister Imran Khan has agreed to bar Bibi from leaving the country until the extremist group, Tehreek-e-Labbaik Pakistan, can appeal the verdict.